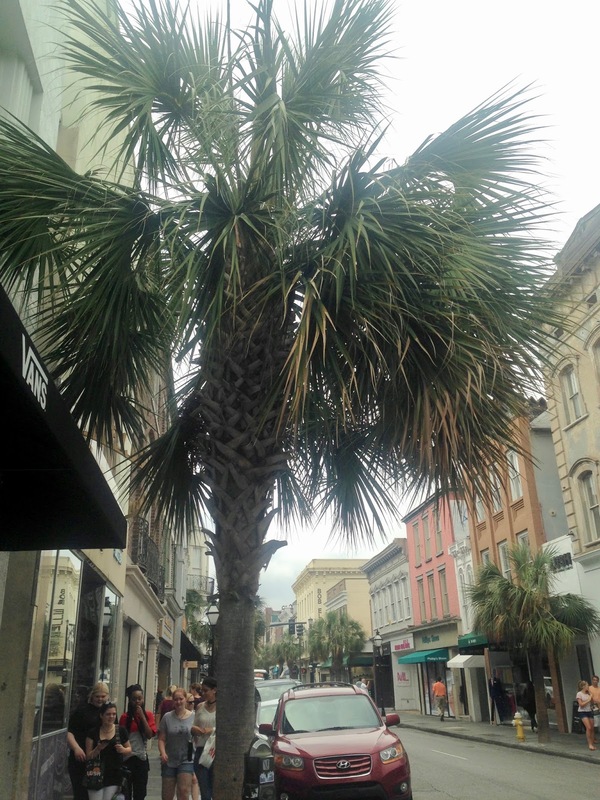 This is the final post off a Travel Series of my vacation to Myrtle Beach. To start at the beginning go HERE. The rest of the posts,, in chronological order are HERE, HERE , HERE, HERE, HERE, HERE, and HERE. 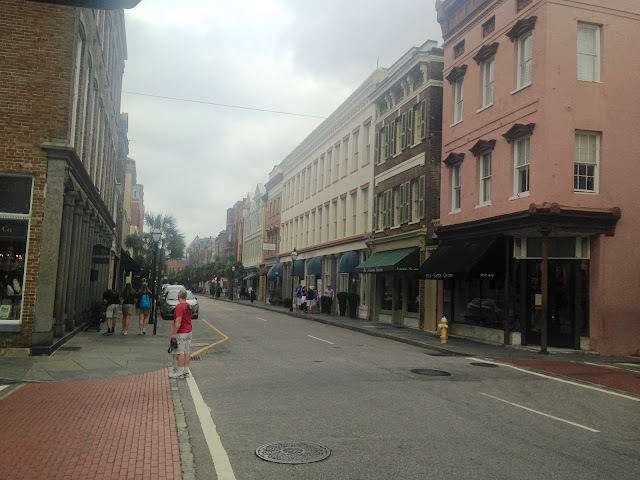 On the very last day of our vacation, we visited Charleston, South Carolina. We arrived bright and early in the morning and went straight to the Visitor's Center. It was a piece of cake to find, right off the freeway. There we bought our tickets to the Carriage Ride and we received advice to just leave our car parked at the center and take free public bus transportation from there. It cost $12.00 to park at the Visitor Center for the day, but a word of advice: get there early if you want to do the same because the parking lot fills up fast! The Visitor Center is absolutely gorgeous in and of itself, and I could have spent hours there just reading all their displays and pamphlets. But we only had a few hours to spend in Charleston, so I could not. The Visitor Center is housed inside an old railway building constructed between 1840 to 1846. 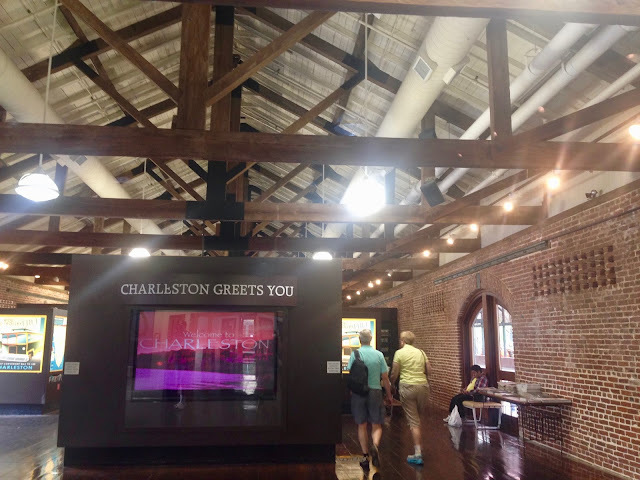 There is a 36 minute you can watch that gives a history of Charleston and suggestions of the sights to see. Following the bus route was super easy, and we arrived at our carriage ride with no problems. 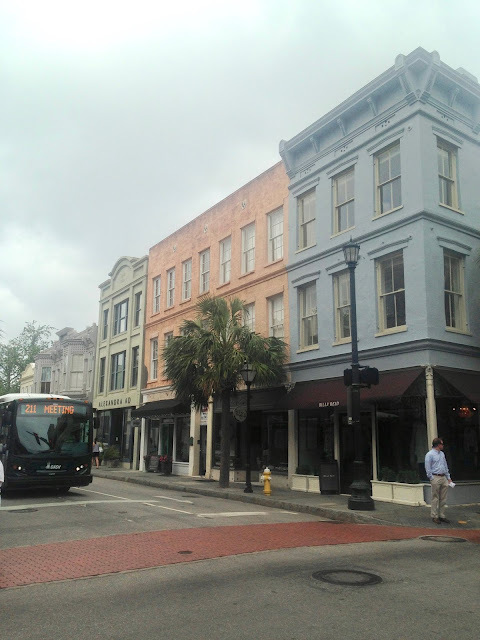 (If you missed my post on "A Carriage Ride Through Charleston" you can catch up by clicking on the last link above.) After our carriage ride we decided to walk through The Historic Charleston City Market, which was right across the street from Old South Carriage Ride. The City Market is a Historic Market Complex that spans four city blocks in downtown Charleston. 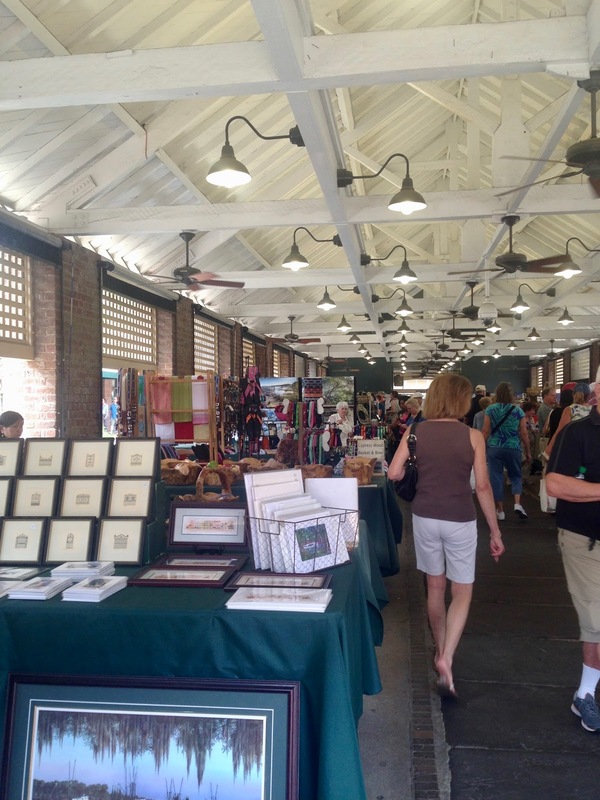 It's one of the oldest market places in the nation and is listed on The National Register of Historic Places as "Market Hall and Sheds". It was initially known as a Beef Market but it burnt to the ground in 1796. Market Hall (pictured above) was added in 1840 as a place for farmers to sell beef and produce. 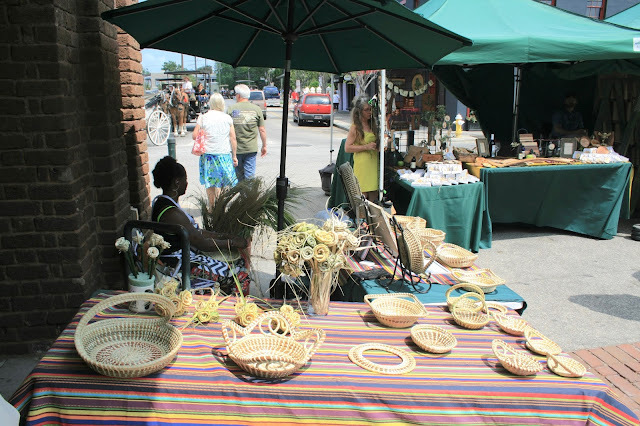 Today it is used for vendors to sell souvenirs. 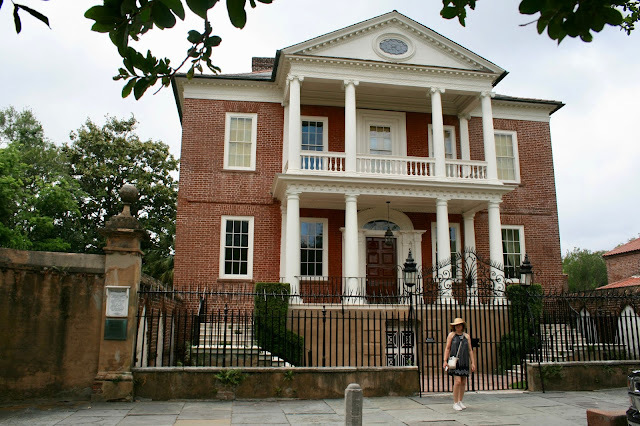 The Charleston Confederate Museum is housed above. I did buy a hand-made ring for $15.00 however! The artist takes local pearls from the ocean and wires them into these pretty rings. The rose-gold color of the pearl sold me! I love it so much, I've worn it every day since I came home! After touring The City Market we then headed to the main shopping area to find a place to eat. I wanted to try some local cuisine and found out that Charleston is known for it's great seafood and barbecue. I love a barbecue sandwich, so off we went. There were many barbecue restaurants to choose from. We picked a restaurant off the main drag and down a side street that seemed a little less expensive (you know me, always the budget tourist!). 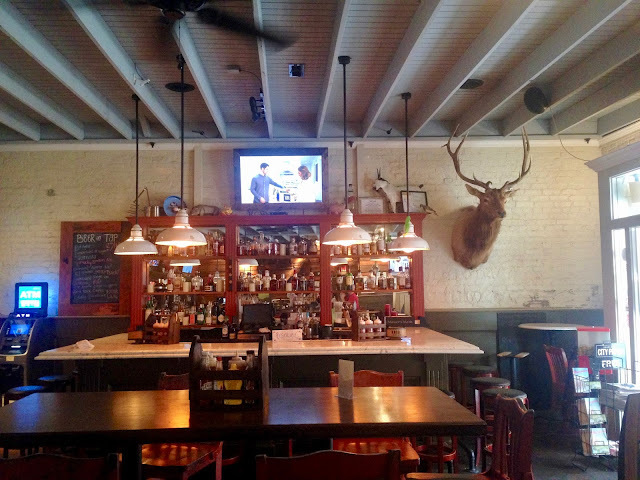 The restaurant had a nice sports bar atmosphere that offered both booths, high tables, and a bar. 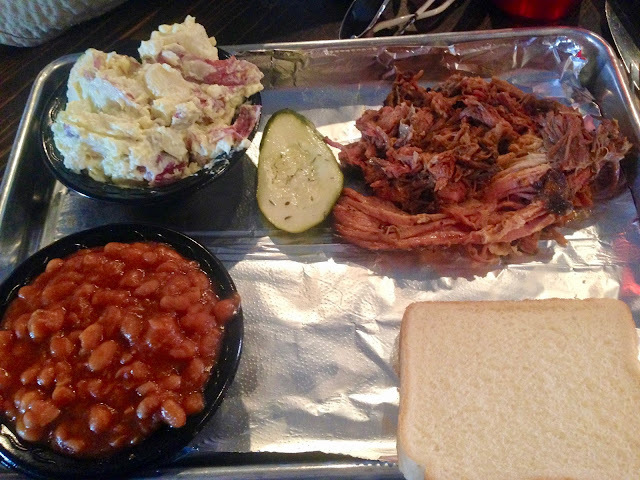 We chose to eat at one of the high tables and ordered a platter which included the barbecue, baked beans, potato salad, and a slice of bread with a pickle. The barbecue and potato salad were delicious, however I was stunned with the single bread slice. I've never ordered a barbecue before that didn't include a bun and I wasn't sure if this was the norm for a Charleston barbecue or if it was just how this restaurant did it. Readers? Any idea? We also ordered Sweet Tea, and it was the best Sweet Tea I've ever had in my life. It was so good that I had to ask the waiter what was in it. He seemed surprised and said "Just Sugar". I must have seemed like an alien from another planet who never had sweet tea before. But I really was perplexed as to why this Charleston Sweet Tea was so good. So I texted Jeannie from A Pocketful of Polka Dots (who is from North Carolina) and I asked her how much sugar she puts in her Sweet Tea. She said a cup and half! No wonder that tea taste so good! Here in the north, we don't put that much sugar in our tea. Maybe a teaspoon in a tall glass or none at all. 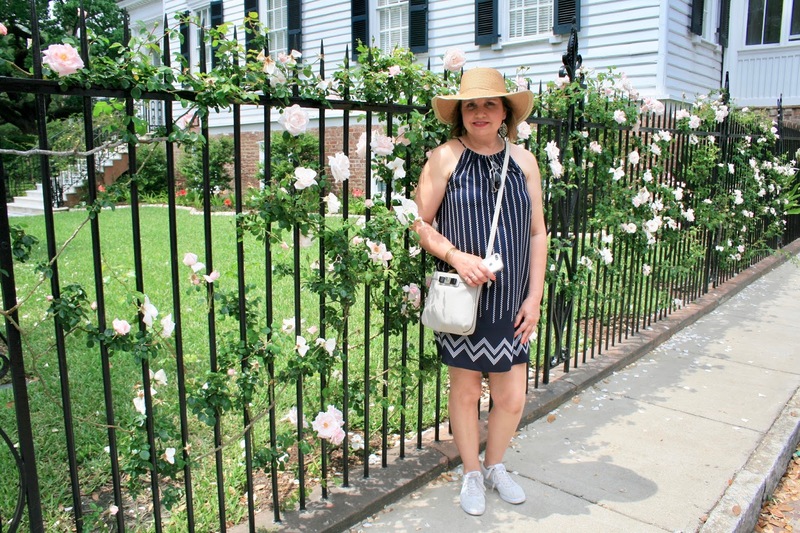 After lunch, my husband asked me what I wanted to see now and I said that I wanted to go back to the area where all the magnificent houses were because I wanted to look at them more closely. 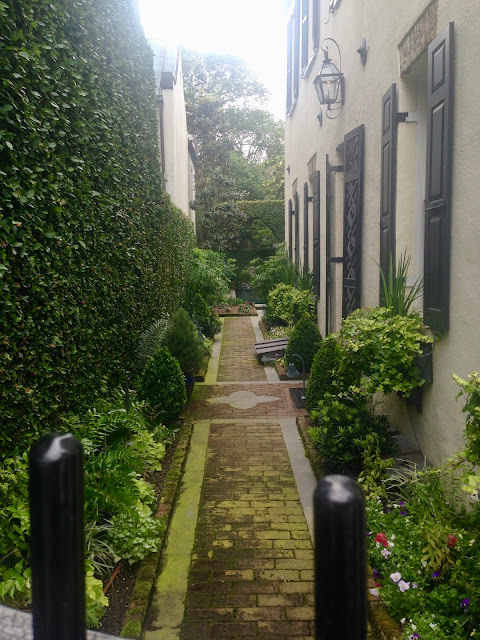 He was surprised that I didn't want to see something different, but I loved those homes so much plus I wanted to check out all their gardens and the side streets. To get back to that district, we first had to walk through the main shopping district. 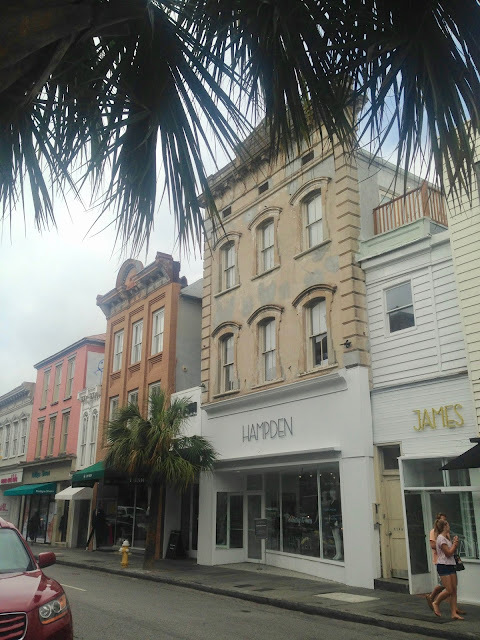 We didn't go inside any of the stores, but just enjoyed all the architecture as we walked by. On our way back to the ocean front homes, we saw many other amazing buildings like churches and public and private buildings. 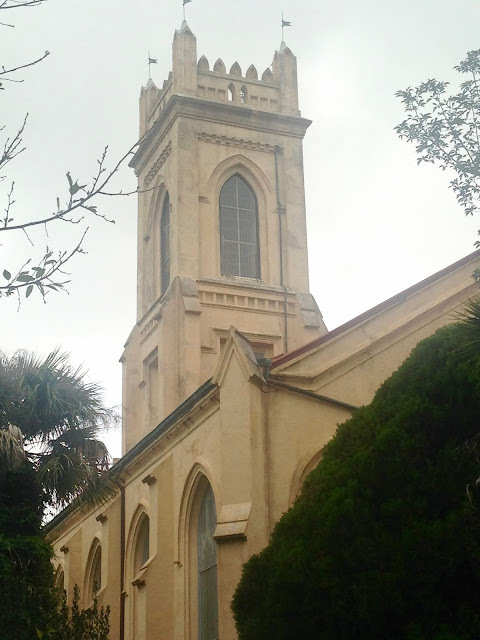 Charleston is filled with so many old churches, some were open for the public too. 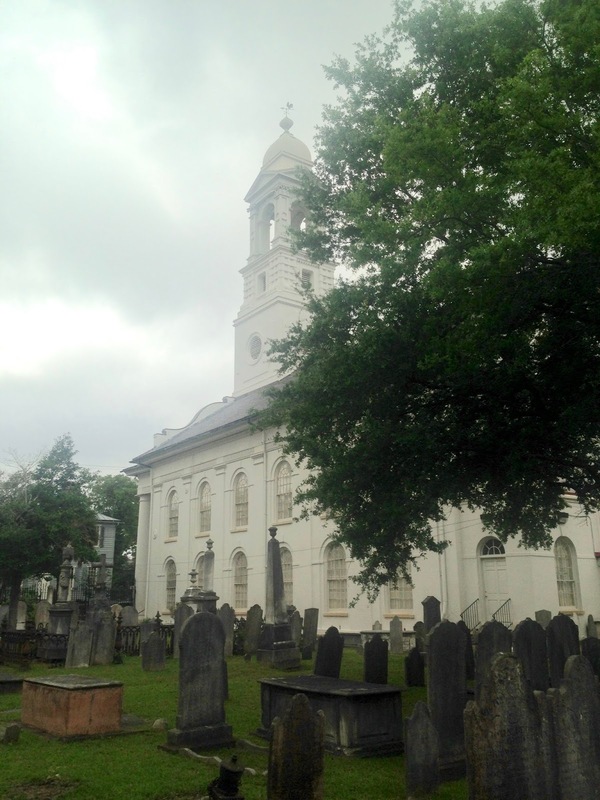 This church had an old cemetery behind it. I love exploring old cemeteries. So many of the tombstones however were so worn that you couldn't read them. If you love museums, you will love Charleston because it is filled with them! This is "The Old Exchange and Provost Dungeon". 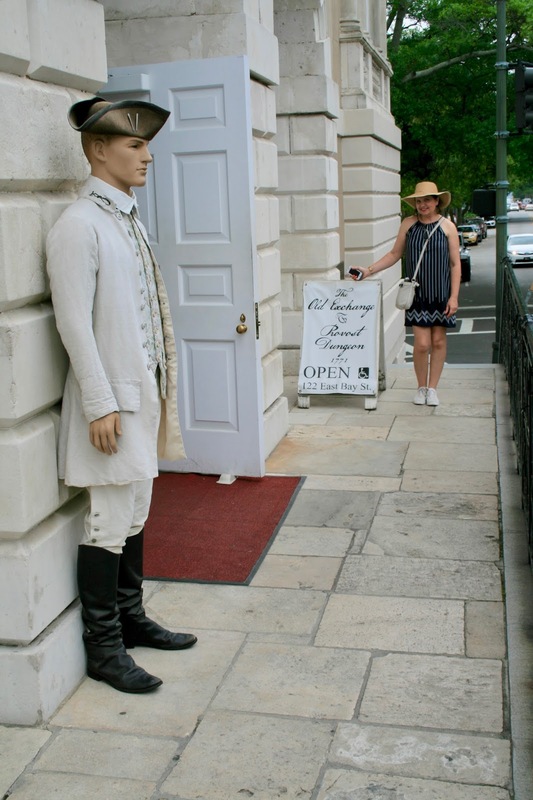 It was built in 1767-1771 and has served a variety of civic institutional functions including a Prisoner of War facility. It is now a museum operated by the Daughters of the American Revolution. 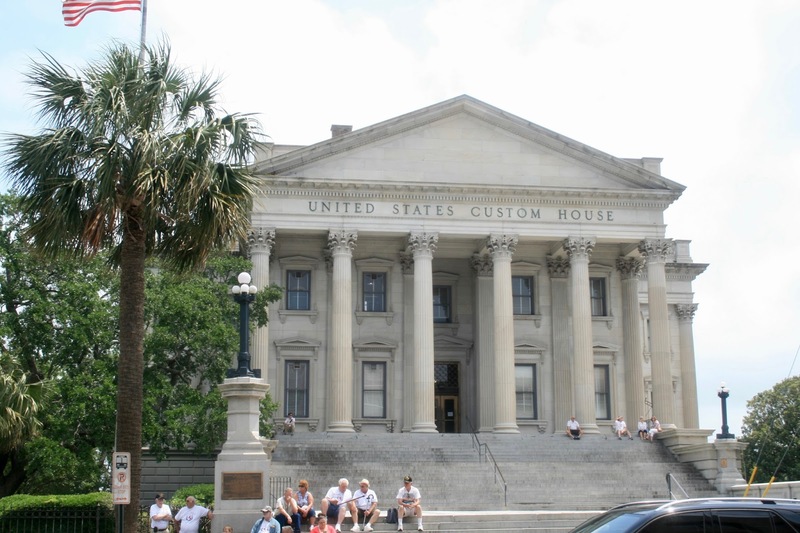 The construction of the United States Custom House began in 1853. What a magnificent building. The people sitting on the top step really give you some perspective of the size of this building. And this cute little building is the oldest known liquor store in the country. 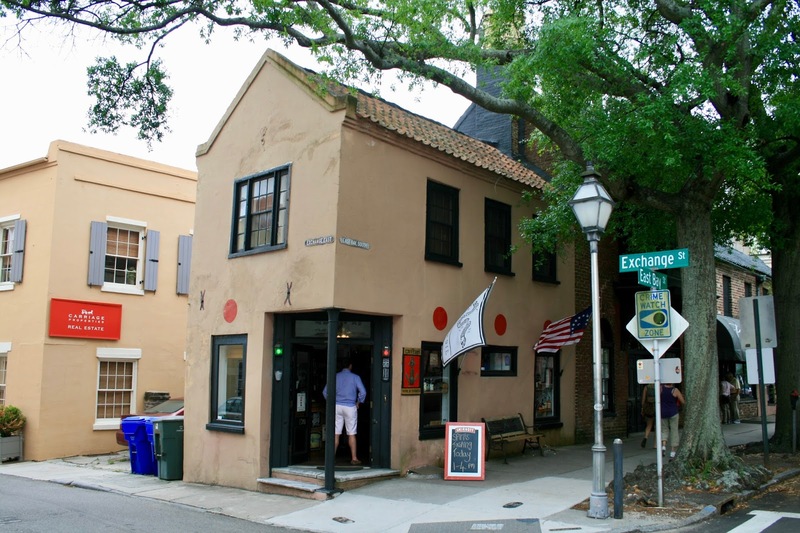 It's called "The Tavern at Rainbow Row". After walking through the main shopping district and businesses, we were finally back in the residential area by Battery Park. It was quite a hike from where we started. We could have taken the free bus, but it was nice to see it on foot and get more detail. 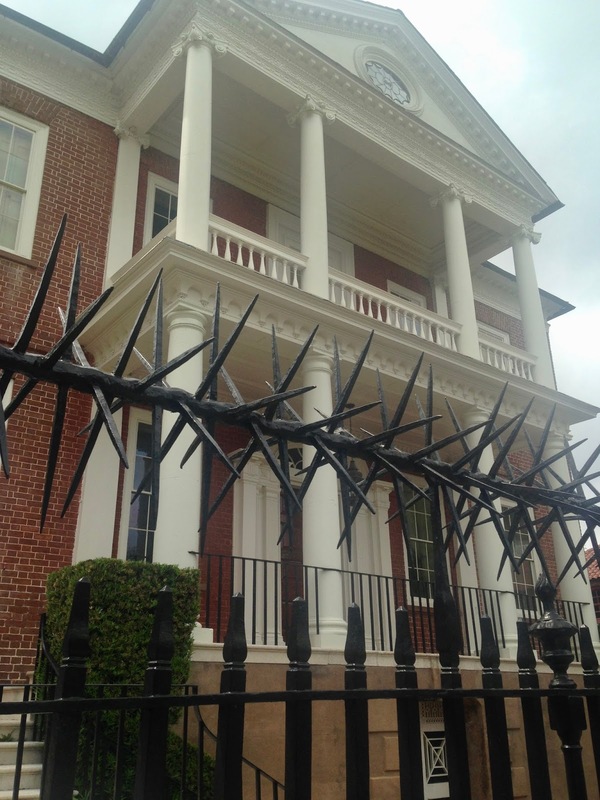 Every single home in Charleston was gorgeous, we took hundreds of photos, but here are some of my favorites. I loved all the houses, and even the little tiny ones, like this pretty pink one, were as charming and jaw-dropping as the mansions. This mansion had the most interesting fence. The top of it looked downright dangerous. I had never seen anything like this before. 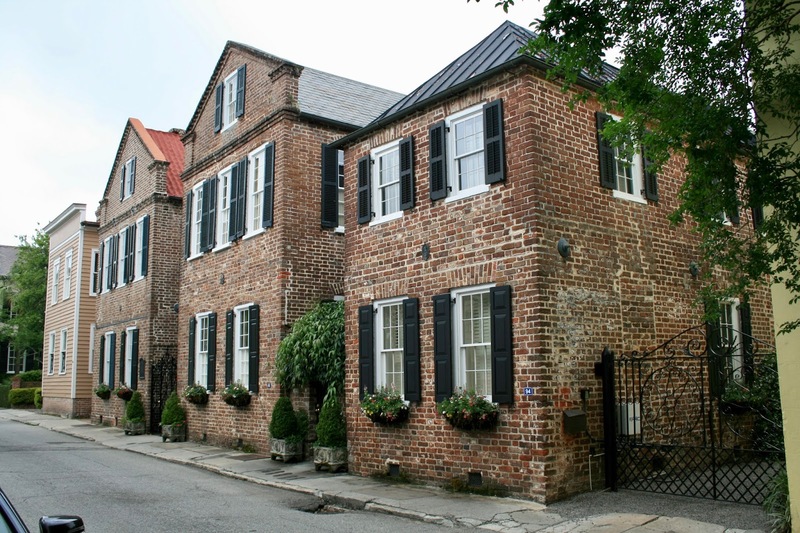 This row of brick homes definitely looked very New Englandish! 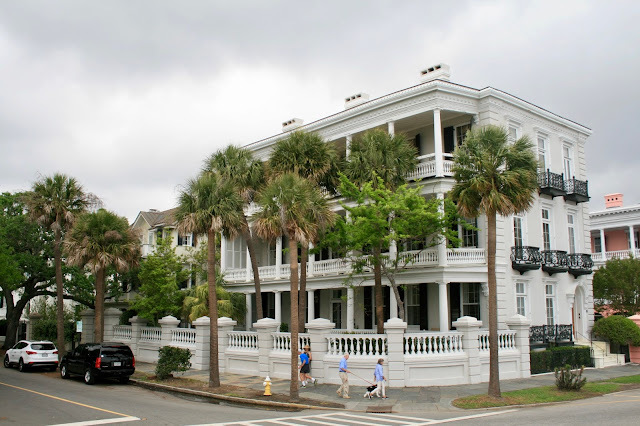 But the most impressive houses are located across the street from Battery Park or the Ocean front. All these homes have amazing ocean views. 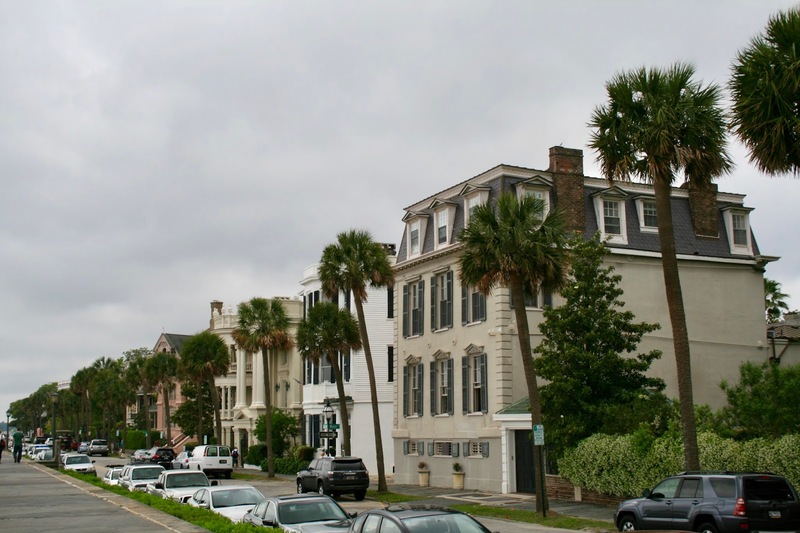 Across from these homes is a walking path along the ocean. 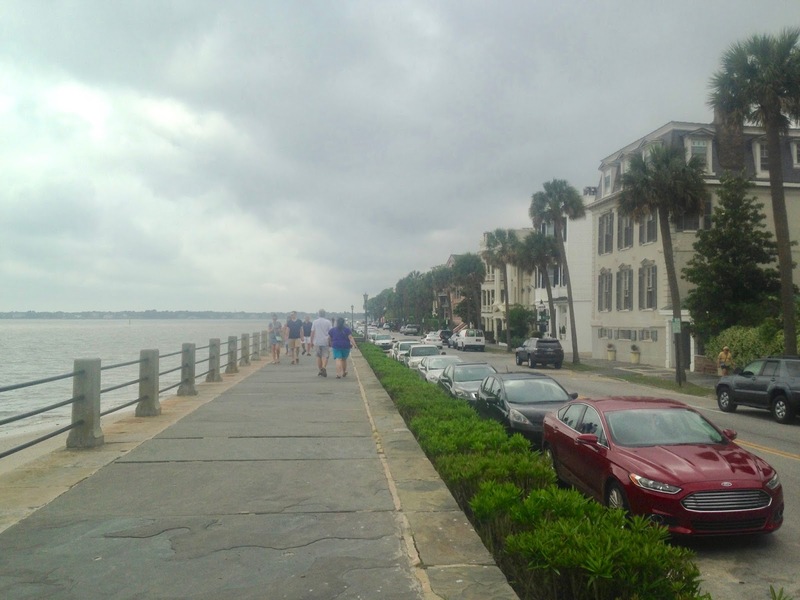 Battery Park has several monuments and war memorabilia to learn more about the defense history of Charleston. 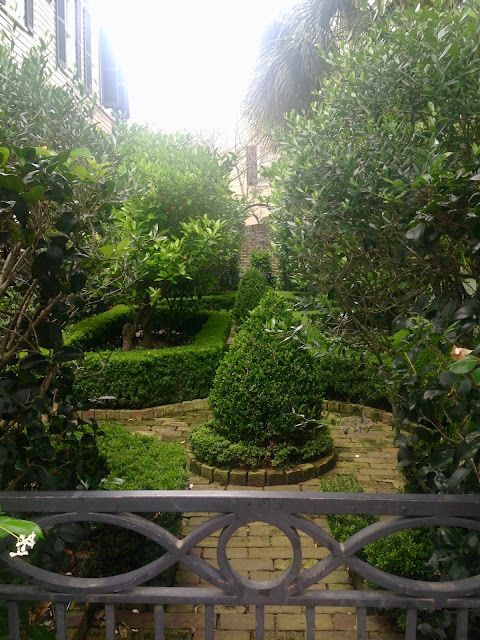 And finally, the gardens. Charleston is known for it's small city gardens. 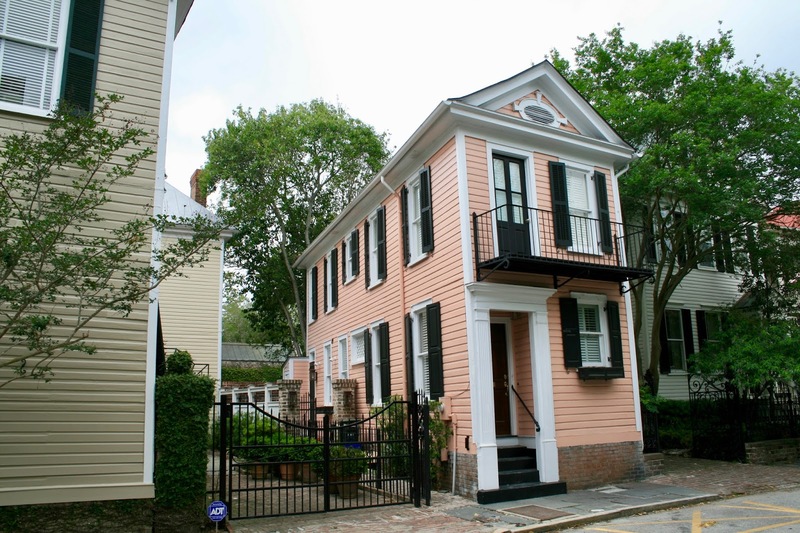 The homes in Charleston do not have big yards and so most of the gardens are small. But I think because they are so small, that's what makes them so interesting. It seemed the homeowners tried to carve out small gardens in whatever space they had to work with, which most often is just a little walk-way between buildings. All the gardens were enclosed by some kind of iron gate, so I couldn't enter any of them. But I managed to take a peek at most of them! I loved this rose covered iron fence. I've never been good at growing roses, so I really appreciate other gardeners ability to grow them. Here's an example of a beautiful garden courtyard created between two buildings. 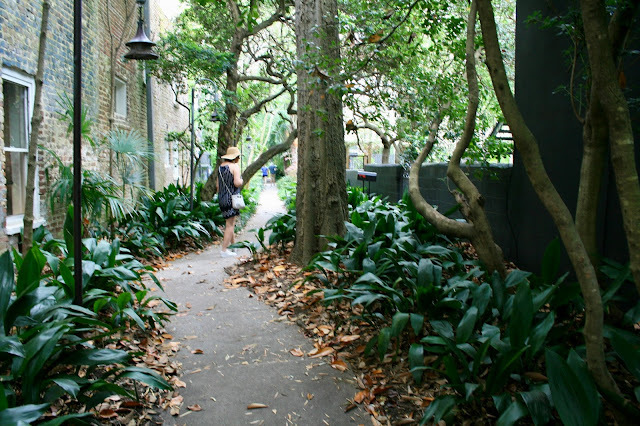 This garden belonged to a church, so I was able to meander along it's path and explore it. 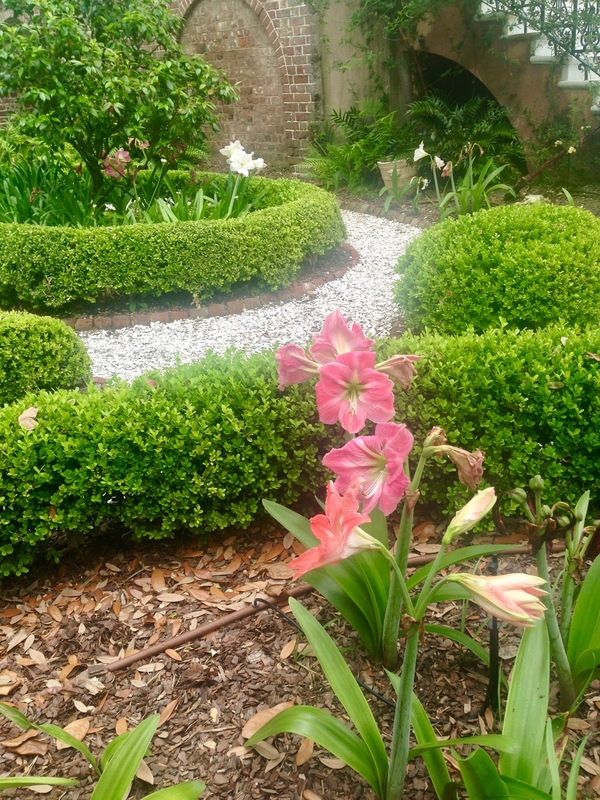 A formal garden with carefully trimmed hedges and amaryllis. That's a flower we can only grow in a pot at Christmas time here in Wisconsin. 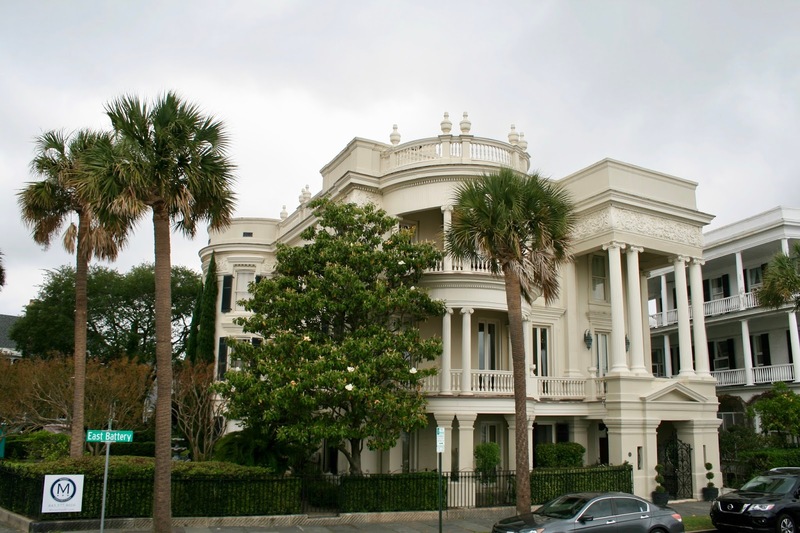 Architecture plays a very important part in Charleston gardens. Iron and brick are predominately used. After walking all day, we were exhausted. Thank goodness we got a hotel only about 45 minutes from Charleston. We were able to check in, soak in the pool a bit, and then get a nice dinner before heading out the next morning for the long walk home. And that concludes my Myrtle Beach Vacation series. I will now return to sharing places we have visited locally or near by until my next big adventure this fall! 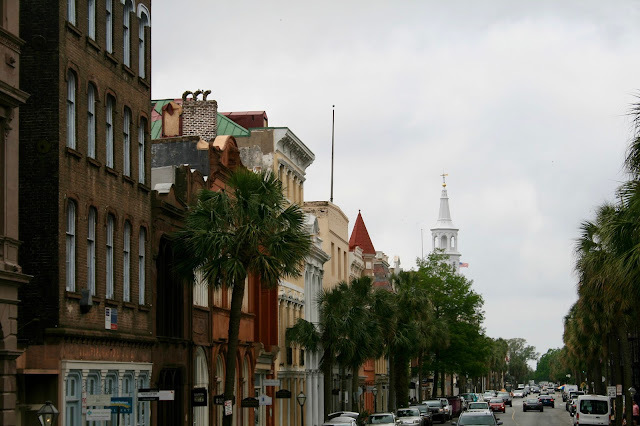 I'm going to Charleston in just a few weeks, I'm so excited! Loved seeing photos from your trip! Oh have fun, I can't wait to see your pictures! Beautiful pictures. 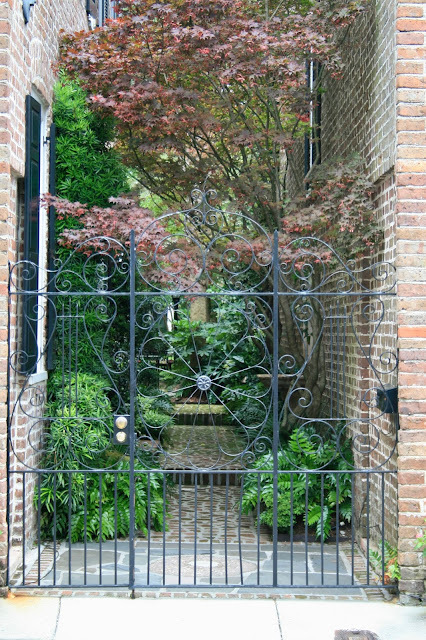 Love those homes with their iron gates and beautiful gardens. Can't wait to see it all soon! Funny how they only gave you 1 slice of bread...makes me think of the guy at the other restaurant you ate at, who forgot to make coffee :) :) ...Maybe this restaurant ran out of bread :) But it does look delicious! Thanks Elli! I'm anxious to hear about your trip and how different it will be from mine considering I went in April and you will be hitting it at the height of the tourist season. That was weird about the bread, but I think this is how they served it.